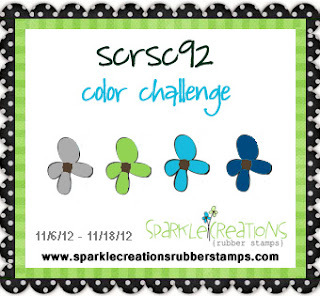 Its time for this week's Sparkle Creations Rubber Stamp Challenge!!! Here is my card using these colors.. I used Tea Set Rin for my card today....she is so cute!!!! All papers are from Echo Park . I figured out how to make a square stitched mat using the Lil' Inker Designs rectangular stitched dies. The sentiment is from the same stamp set. The Pink Elephant Monday Card Challenge: Dies/Punches. Tammy's Scrapin Corner : Anything Goes. Challenges 4 Everybody: Anything Goes. To play along in our challenge, upload a photo of your project and provide a direct link in the linky widget at the bottom of the SCRS challenge post. If you use an online gallery (e.g. Splitcoast), please also use the keywords SCRSC92 and SparkleCreations (no spaces). If you have a Facebook account and are a fan of Sparkle Creations Rubber Stamps, you can also upload there. Deadline for challenge #92 is Sunday, November 18th @ 9 PM PST. 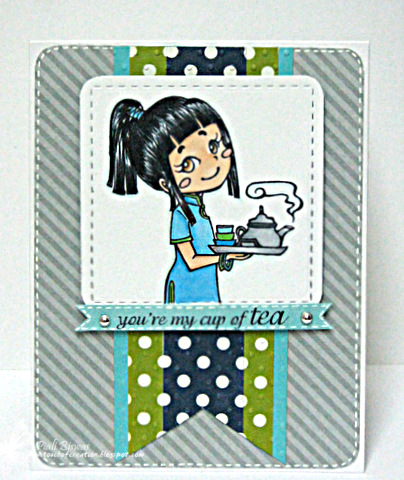 What a cute tea card. I love the colors and the background. Thank you for your entry this week. Please come back next week. Such an adorable card, thanks for entering our challenge at Tammy's Scrapin Corner. We hope to see more from you in our challenges. What a stunning card. I like your colors choice and that image is so cute. Also love the CAS style design like Plastic card which make the card POP. Thanks for sharing.